The Asaka branch of the imperial family was founded in 1906 by Prince Yasuhiko, the eighth son of Prince Kuni Asahiko. In 1922, while serving at the Military Staff Col lege, Prince Yasuhiko went to France to study military affairs. After he was injured in a traffic accident there, his spouse, Princess Nobuko, joined him, and together they remained in France until 1925. Their stay coincided with the golden age of Art Deco in France. Fascinated by the beauty of Art Deco, the prince and princess decided to incorporate its glories into their new residence, for which they commissioned the French artist Henri Rapin to design the interiors of the principal rooms. 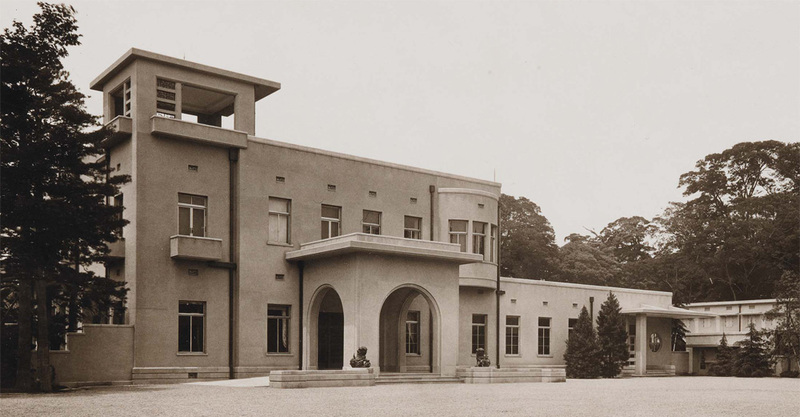 The architect in charge of designing the building, Gondo Yokichi of the Works Bureau of the Imperial Household Ministry, had been a passionate student of modern architecture while training in Europe. The superb craftsmanship long cultivated in Japan was, moreover, utilized in every aspect of its construction. The Prince Asaka Residence is, thus, itself a work of art, the result of the enthusiasm of the prince and princess and the combined abilities of Japanese and French designers, architects, and craftsmen. While it is now used as a museum, no significant changes have been made to its interior. A valuable historic structure that accurately embodies the Art Deco style and provides a glimpse of receptivity to other cultures that flourished in Tokyo in the early Showa period, the residence has been designated as one of the Japanese nation's Important Cultural Properties. 1933 The Prince Asaka Residence［ now the TokyoMetropolitan Teien Art Museum］ is completed in May. 1947─1954 The residence is borrowed by the government and serves as the official residence for prime ministers Ashida Yoshida Shigeru. 1955─1974 The residence is used as the state guesthouse until replaced by the Akasaka State Guesthouse. 1983 The residence opens to the public as the TokyoMetropolitan Teien Art Museum from October 1. 1993 In March, the main building［ the former Prince Asaka Residence］becomes the first structure to be designated an Important Cultural Property by the Tokyo Metropolitan Government. 2014 In November, the museum reopens. 2015 In July, the main building, tearoom, central entrance gate and other elements of the residence are disignated as Important Cultural Properties. 2017 In November an elevator was installed in the main building. 2018 In March, the European Garden and restaurant will be completed.